So…What Went Wrong Last Season? Going into last season, there were some major questions to be answered. The Penguins fired both Dan Bylsma and Ray Shero, and brought in Coach Mike Johnston and GM Jim Rutherford. Not long after Rutherford came in, he traded former 40 goal scorer James Neal for Patric Hornqvist and Nick Spaling. Well, Spaling didn’t work out, but Hornqvist certainly did. He even made plenty of successful trades during the regular season, including adding David Perron to the top 6 forward core, and absolutely stealing former first-round pick Ian Cole for Robert Bortuzzo and a 7th round pick. Although his trade for Ben Lovejoy wasn’t a very well-liked trade among the Penguins’ fan base, Rutherford assembled a half-decent team with what he had to work with, as well as the time he had to accomplish it. It wasn’t his fault. The Penguins came out of the gate looking better than ever. They started out 13-3-1 and were clicking at about 40% on the power play, which is just absolutely absurd. Clearly, his strategy was working. Then something happened. 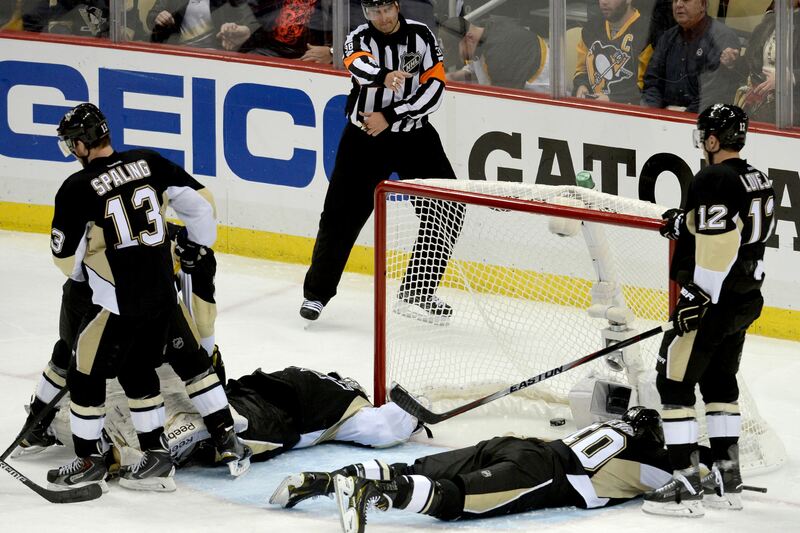 Something stopped working for the Penguins. After this fantastic start through 17 games, the Penguins finished 30-24-11 in their final 65 games. This may not look awful, but if we grouped regulation losses with overtime and shootout losses, the Penguins finished 30-35 in their final 65 games. Johnston’s strategy seemed to work fine in games 1-17, so I’m not so concerned about him either. In addition, I have read glowing reports from the players that they are really believing in Mike Johnston’s coaching strategies and ideals. So it wasn’t the new coach, it wasn’t the new GM…so let’s start looking at the players. Well, there were a lot of injuries… The Penguins 30-24-11 streak began the game after Pascal Dupuis was diagnosed with a blood clot. Around this time, Olli Maatta was diagnosed with a cancerous tumor. Ehrhoff dealt with multiple concussions during the year. Letang suffered a concussion late in the season that looked like it may be devastating to his career, so thank goodness he is okay. And even Pouliot, who played a lot for the Penguins last year, was injured going into the post-season. Yeah, something tells me a top pair of Paul Martin and Ben Lovejoy aren’t going to get things done. Unfortunately, it didn’t. So yes, I believe injuries were a major factor to the major downfall of last year. 1) Mike Johnston’s system depends on puck moving defensemen and defensemen who can contribute to the offense. Well, all of those kind of guys were in and out throughout the season. Heck during the playoffs, Letang, Maatta, Ehrhoff, AND Pouliot were out with injury. Yikes. 2) Surprisingly, the Penguins ranked 10th in the NHL in goals against despite their lack of a healthy defensive corps. The place they struggled the most was in the goals for category, in which they placed 19th in the NHL. I understand that in Mike Johnston’s system, the defense is important even to the offense. That being said, the forwards have to produce, too. That’s what they’re getting paid to do. So let’s look at the forwards. Neither Crosby or Malkin came up big in the playoffs (besides maybe game 2), however, both were battling significant injuries, so I will try to let that slide. However, the supporting cast for future hall of fame forwards Crosby and Malkin was absolutely unacceptable, especially when a player such as Dupuis missed a large chunk of the season. Perron played great in Pittsburgh his first 10 games or so, then fell off the face of the earth. Comeau was not the same after coming back from his wrist injury. And Kunitz had a major drop off last season, and just couldn’t find the back of the net. Hornqvist was about the only man who consistently did his job, and this includes Crosby and Malkin. Overall, my three key factors to the downfall of last season are the following: injuries, injured puck moving defensemen, lack of offense/supporting cast. Want to know which factor I think most contributed to this downfall? Lack of offense. Lack of a supporting cast for Crosby and Malkin. Well guess what. Rutherford fixed that. The Penguins are rolling with 4 lines that can score this year. They have Crosby, Malkin, Kessel, Hornqvist, Plotnikov, Perron, Bennet, Sprong, Kunitz, Dupuis, and the list goes on… They were 19th in goals for last year. 19th! With 2 of the best forwards the NHL will ever see. No excuses can be made this year for this team. Regardless of whether their defense performs extraordinary, this team should be top 5 in goals for and power play percentage by the end of the year, which ideally, will put them atop the Eastern Conference once again. So, how does one score goals? I’ll be discussing that tomorrow (technically, later today) in my final article leading up to the Penguins season opener: Shoot the Puck!